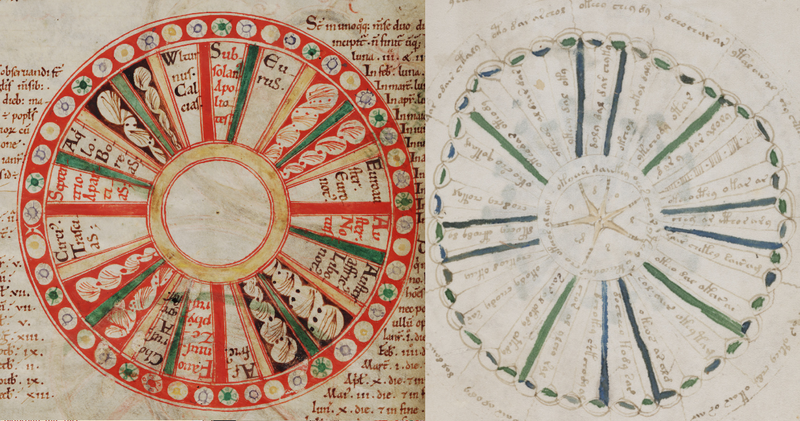 There has been a discussion about the dating of the folio numbering of the Voynich manuscript over the years. Some experts suggest the page numbers could have been placed on the parchment as late as 16th and 17th century. 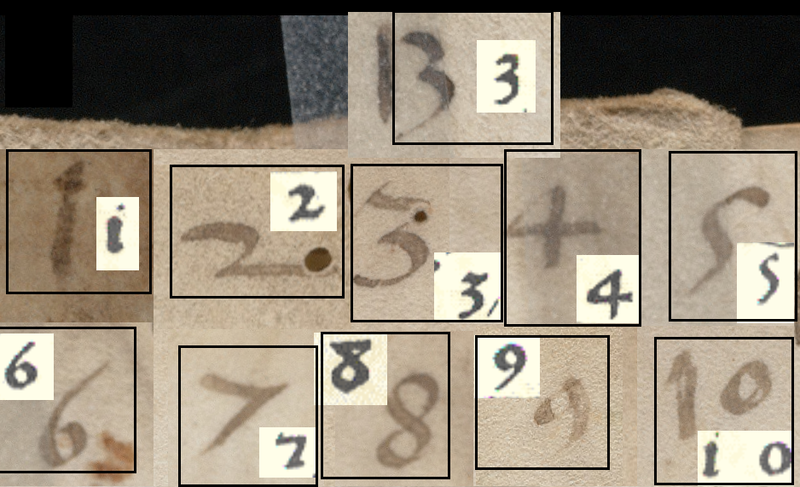 It is clear that the folio numbers of the VMs do not belong in the early 15th century because numbers 4 and 7 were written differently at that time. 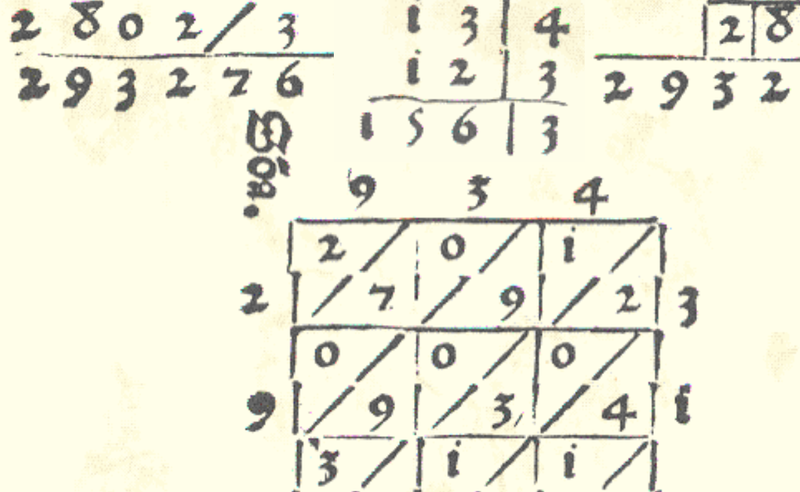 Is it possible though for the page numbers to originate in the 15th century. 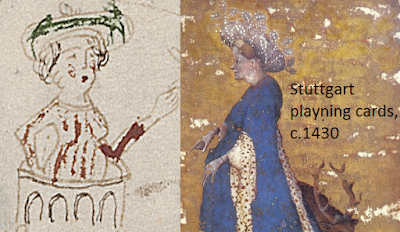 It seems the answer is: Yes, in the late 15th century. 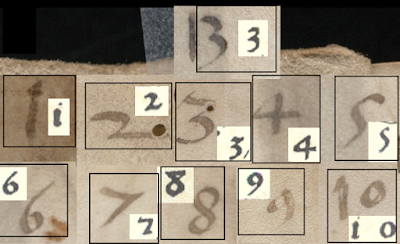 Below is a comparison of the VMs folio numbers with the fonts used in the Treviso Arithmetic - the first printed math book in the West that came off the presses in 1478. 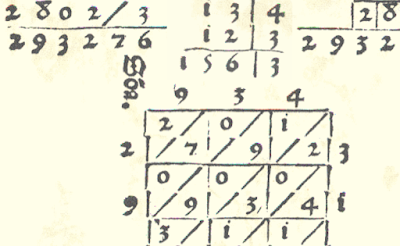 It is known as "the blue cube"in the Voynich manuscript. However, two of the sides of the object seem to be colored in now faded yellow. This makes the object look like a book with blue cover and gold-leaf edges. There seem to be couple of round details along one of the edges that makes the object look like a Cookie Monster lunch box :) It is not clear if those are intentional or just coincidental. 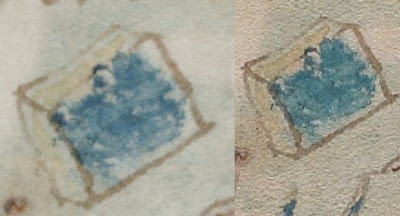 If we imagine for a moment "the blue cube" to be a book these dotted details could represent some kind of book clasps. 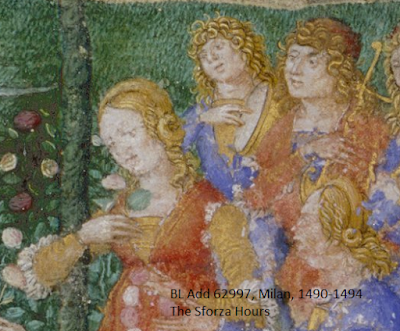 Zoom-in of the possible book clasp detail. There are other interpretations of the cube drawing - most often it is perceived as a mineral. Did Rudolf II have the Voynich manuscript in his library? 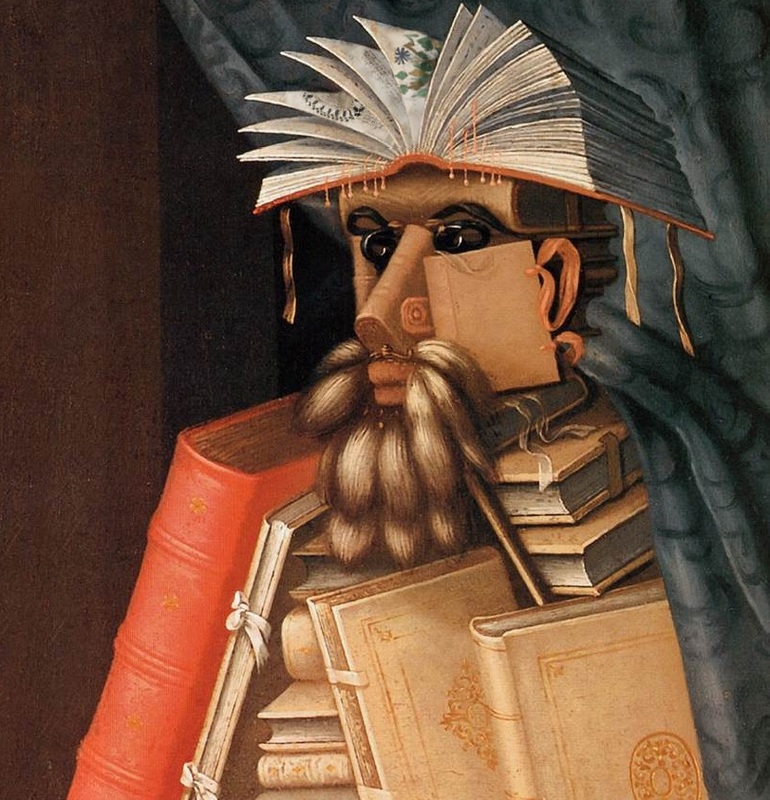 Look closer at Giuseppe Arcimboldi's Librarian. The plant on fol. 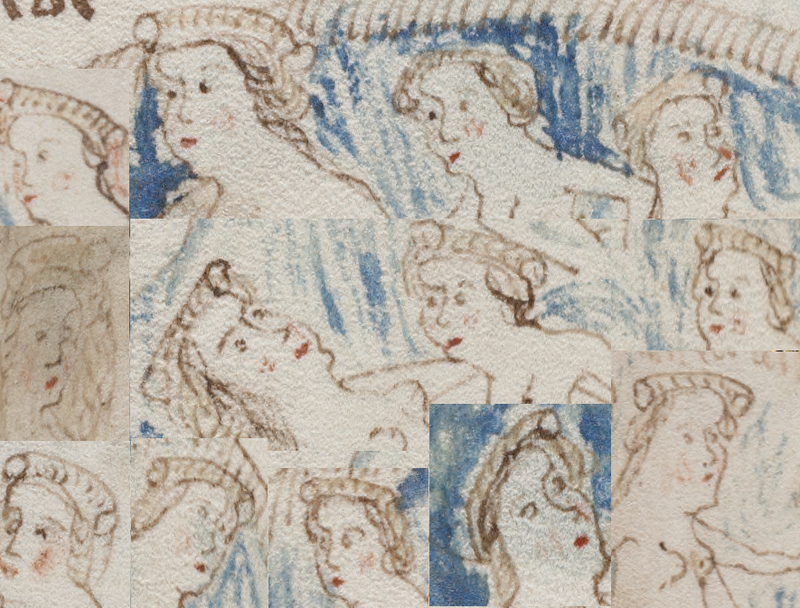 46v of the Voynich manuscript has one of the most fascinating roots in the book. D'Imperio describes it as "a bird with spread wings: an eagle!" in An Elegant Enigma. 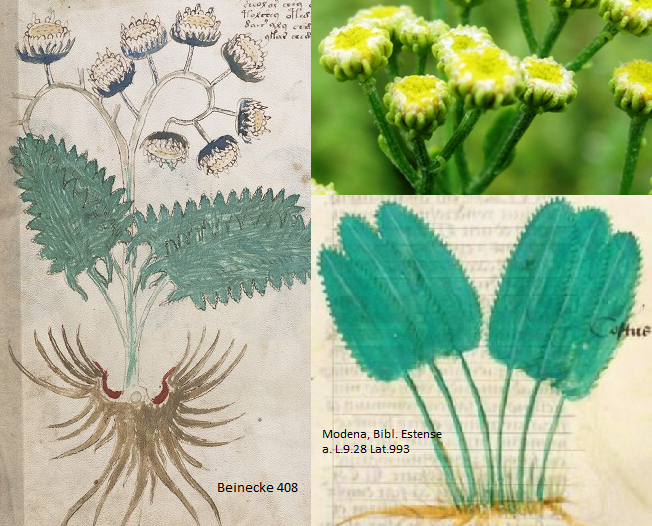 I believe the plant was meant to represent costmary (Frauenminze) - found in the old herbals as the herb of Virgin Mary. 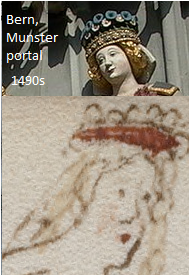 So I looked around to see if I can find any connection in iconography between Virgin Mary and spread-winged eagle. Here are couple of examples. 1491 propaganda brochure by emperor Maximilian I tells the story of celestial vision at Constantinople described as virgin with wings held by three-headed knight. BSN cgm 598, Buch der heiligen Dreifaltigkeit, dated 'not before 1467' shows the Virgin and Jesus crucified in a form of double-headed eagle. 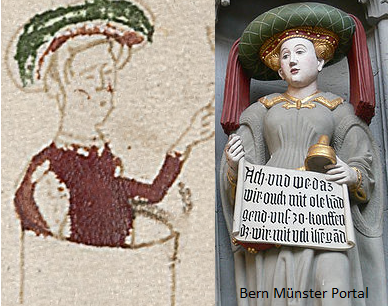 Other alchemy manuscripts (15th-16th century) show winged Virgin as symbol of philosophical mercury. 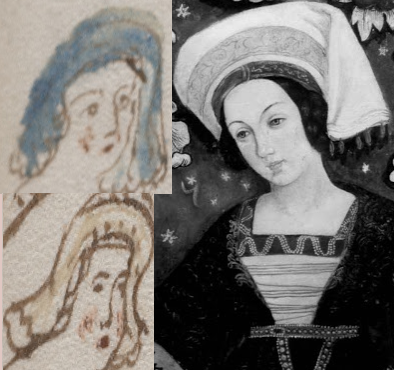 So in late 15th century Germany somebody could have made association between costmary (the herb of Virgin Mary) and eagle with spread wings. Among the simple joys of studying the Voynich manuscript is researching castles, flowers, old books and... fashion. Let' take a closer look at the VMs women headdresses. Probably the most weird is the one that looks like a roll on top their heads. 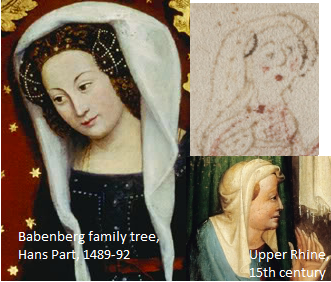 The closest I could find are couple of ladies from the Babenberg Family Tree triptych made around 1490 in the workshop of Hans Part for the Klosterneuburg Monastery, just north of Vienna. 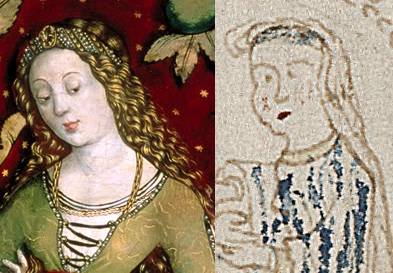 The first example is with what looks like half roundel decorated with round pins at the ends with braided hair down. The second one is with hair up and accessories hanging from the pins. The Babenberg family tree also features braided hairdo typical for the second half of 15th century Germany. 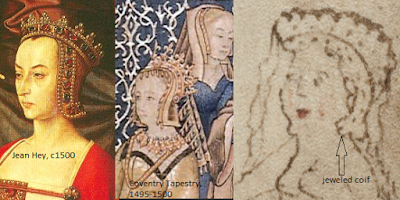 There are also some examples of fashion that was more widely spread in 15th century Europe - like veil over buns. 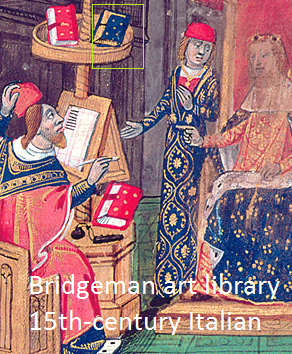 Similar hats can be found also in Germany in the first half of 15th century. 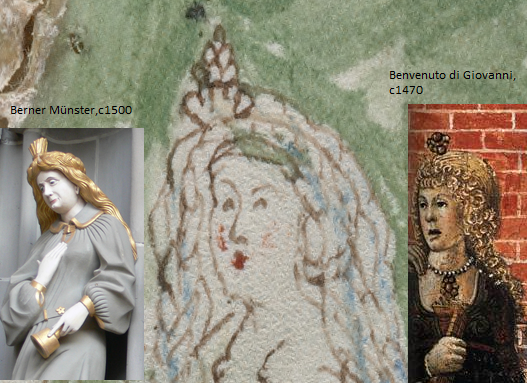 Renaissance Italy has a lot of nice examples of hair jewelry. As always, these are just subjective interpretations, not facts in any way. Wind diagram maybe part of the rosette on fol. 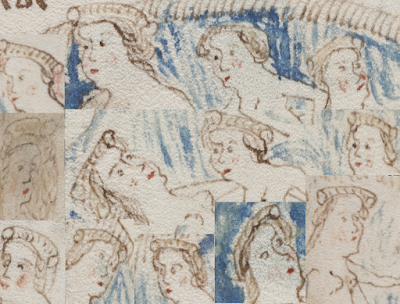 69r (per JD) of the Voynich manuscript. 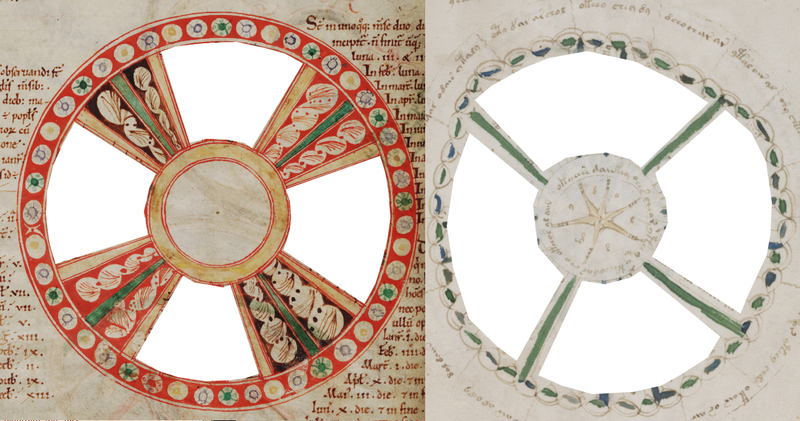 There is some similarity with the unique wind rosette in Oxford, St. John's College MS 17 (12th century, England, visit here ). MS 17 has somewhat unusual wind rosette - it divides the winds into four groups of three. 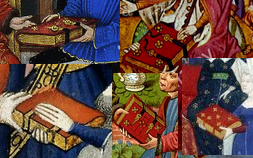 The first set of dividers - those separating the quarters - are decorated with stylized foliage and yellow borders. They may correspond to the green lines in the VMs drawing. The second set of dividers - those dividing each quarter into three parts - may correspond to the blue lines in the VMs rosette. 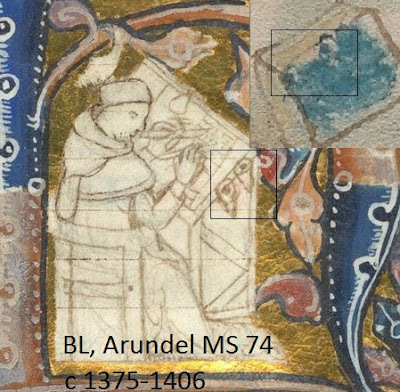 To save you time, I counted the dotted bubbles decorating the border of the rosettes - 46 in MS 17 and 45 in the VMs. 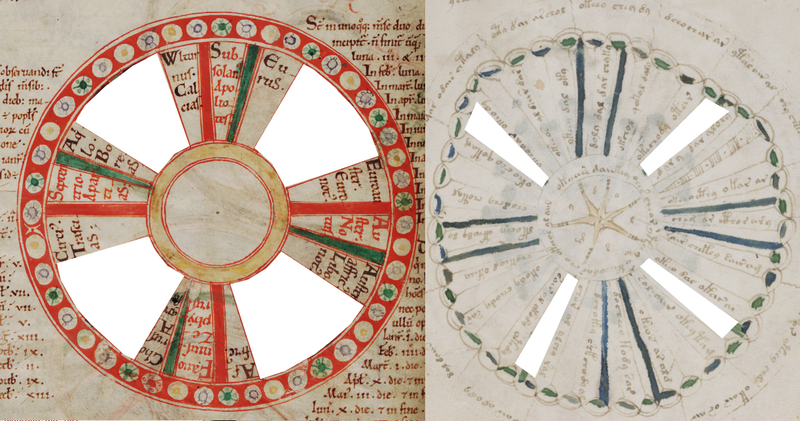 Among many stars in the Voynich manuscript there is an odd spiky symbol that resembles one found in early 13th century copy of Hildegard von Bingen's Liber Scivias. According to the label this is a symbol for thunder - tonitrua in Latin. Similarity is probably coincidental, but just for fun I'll speculate that the VMs spiky star represents thunder. Let's see what's around it. The drawing may represent the fact that the light reaches the person before the sound. What could the cross-shaped device producing thunder and lightning be? Maybe a cannon? "From the violence of that salt called saltpetre so horrible a sound is made by the bursting of a thing so small, no more than a bit of parchment , that we find [the ear assaulted by a noise] exceeding the roar of strong thunder, and a flash brighter than the most brilliant lightning"